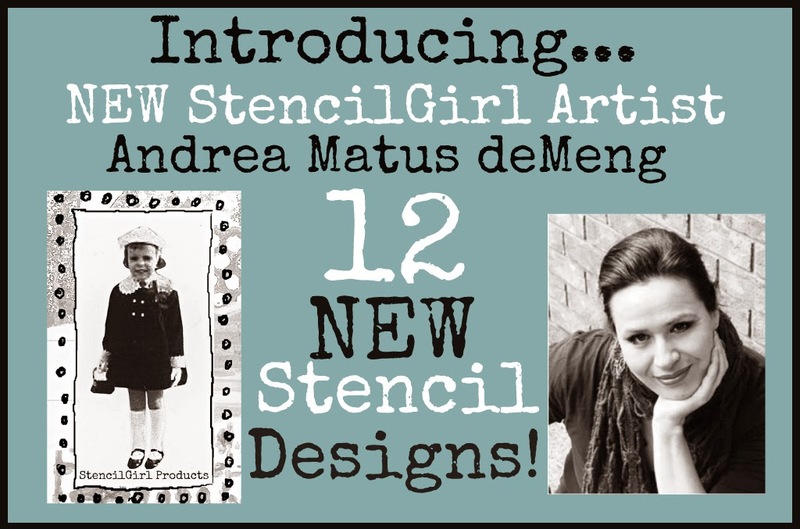 We are thrilled to have Andrea as a new artist at StencilGirl Products! To find out more about Andrea, please visit her profile on our website and her website. Are you ready to see the new designs???! You can find them all live and ready to ship on our website. 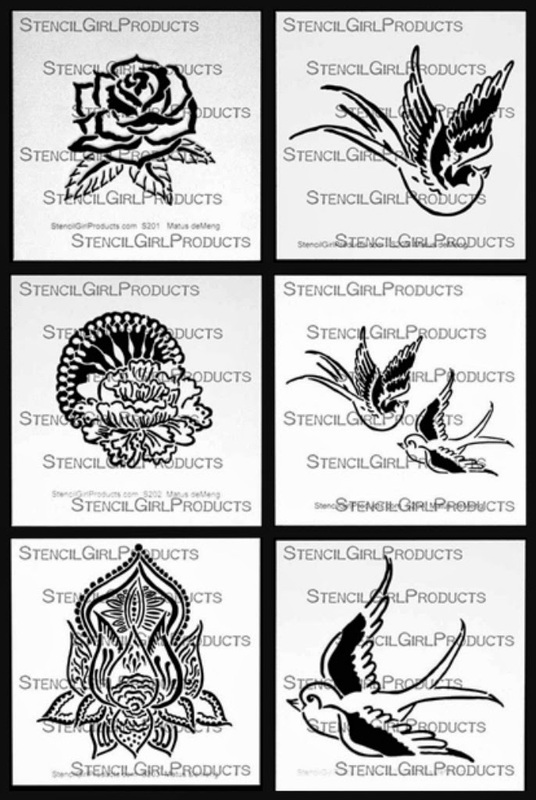 The StencilGirl team, along with Andrea and Mary Beth are here to show you some inspiration for these fabulous designs! Grab your favorite beverage, sit back and ENJOY! We will choose TWO winners! The first winner will win a set of all SIX new 9" x 12" stencils by Andrea! and the second winner will win a set of all SIX 6" x 6" new stencils by Andrea! Just leave us a comment welcoming Andrea to the StencilGirl Products team and let her know what you think of her new stencils. We would LOVE if you would follow us on Facebook, Pinterest, Google+ and Bloglovin. However, this is not required to enter the GIVEAWAY! ALL comments in the entire Blog Hop are eligible. The more blogs you comment on, the more chances you have to WIN! Hi Andrea, nice to meet you and good to have another talent designing for the Stencil Girl team. I love your stencils expecially the faces, i can imagine what fun i will have with those. I love those face stencils they look amazing! Congratulations on joining the design team. Such versatile stencils! This hop was amazing, so much talent!! I have really enjoyed this blog hop, lots of amazing ideas for these fab stencils. Thank you to all on the design team for sharing your methodologies. Lovely stencils! I really love the 6 x 6 ones. Congrats to you, Andrea, on joining the design team and to StencilGirl for having you on the team. Welcome Andrea and I do LOVE your stencils! Hoping to be one to win so I can do some more creating with these beauties. Welcome Andrea! You know I am a big fan already, and your stencils are over the top! Love what you've created with them already, too! So many wonderful details! Love Andrea and so glad she has joined your team!! Yay! Welcome Andrea! Love the new stencils! Welcome. I can't say that I like skulls but the faces and swirls are great! I love Andrea's stencils. Can't wait to try them out. Wow! I am loving these! I've never wanted a face stencil until now!! Gotta have's for sure. Welcome and keep 'em coming. wowsers... Andrea has really made a splash with these designs! can't wait to get my hands on those faces! gorgeous! WoW these are amazing!!! I would love to win!!! What a great deal. Looking forward to seeing future stencils from Andrea. Welcome to the team Andrea!! These are so neat! Looking forward to seeing what everyone has done with them! Great stencil designs and .... faces are my thing too! I've entered these things before, but this time I really, really hope to win. Wish me super luck this time!! Andrea's stencils rock!! ~ a lot of possibilities with using them. I am enjoying the Blog Hop!! Welcome to stencil girl...I love love love your stencils!! Welcome Andrea! Only just discovered Art Abandonment and LOVE what you started there. So glad to have you here and as Audrey said, your stencils do rock! My mind is already conjuring up all kinds of possibilities!!! I'm all rather new to using stencils. I have a few but kinda do the same thing over and over. I have to say finding this site and Andrea's you have inspired me so much. The participants on the blog hop are all so different but each one absolutely stunning. Thank you all for the help you've given me today. Just need the new stencils and let the journey begin!! What a generous give-a-way! I loved seeing how each artist did something totally different with the stencils. Beautiful! I absolutely love Andrea ideas in stencils...saves me soooo much time in sketching my ideas out, transferring...yada-yada! Thank you so much Andrea Matus deMeng!!!!!! Welcome Andrea! LOVE all the stencils. Lovely, unique stencils. Welcome Andrea. Andrea, these designs are fantastic! My shopping list just got longer! Hi Andrea. What a great addition to the team! Your stencils are such individual, strong designs. What great new stencil designs! LOVE the face! LoVe your stencils Andrea. WOW, I just finished the Hop & Andrea you have joined a very talented group of artists. What they did with your stencils was brilliant. welcome to Stencil Girl. And, wow, your stencils are great. What beautiful stencils Andrea! I'm glad you've joined StencilGirl. I can't wait to see what else you have in store for us! Andrea-- I love your stencils. If I don't win them, I will buy them. Welcome to StencilGirl, where we all love stencils. Andrea, welcome to the design team. Love these stencils. They are awesome. Thanks for the chance to win! Andrea - Welcome! I love how the faces stencils can interact with the Dia de los Muertos one. These are fascinating. Thanks for sharing. Awesome projects today. Thanks for all of the inspiration. Welcome! I really love the face stencils. Welcome. While I don't use people in my work, I look forward to seeing what you do. And I daresay one can use pieces of people stencils tho I admit that sounds a bit like Hannibal. The new stencils in this collection look great!! Can't wait to get my inky painty hands on 'em!! Welcome! I love the lotus stencil-there are so, so many mediums that pop into my head for this beauty! Yay Andrea!. The stencils are amazing! See you soon! Great stencils, Andrea....all of them! I'm particularly intrigued by the Dia de Los Muertos sugar skull. Love! I know your art from the Art Abandonment Project, which I follow and participate in. Great to see you here too. Welcome Andrea! I love the girl stencils. Don't have any in my stash. Would like to try using a stencil instead of relying on my still learning drawing skills. A very big welcome to Andrea and her wonderful stencils. I've taken 3 workshops with her! Welcome Andrea! I've been waiting for your stencils, and you have not disappointed! I love them all! 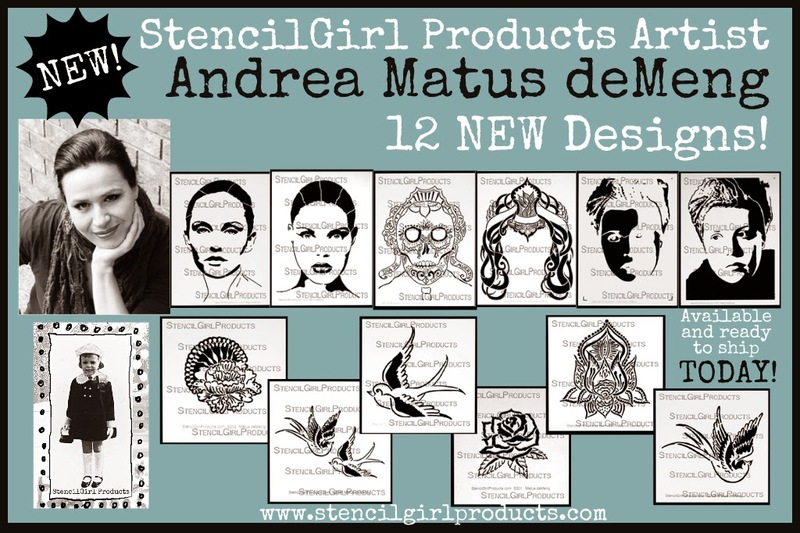 A huge StencilGirl welcome Andrea! I am in LOVE with your girly face stencils (9x12)!! They are all fantastic! Terrifically talented! A fab set of stencils for sure! Welcome. I hope you enjoy your new adventure. Welcome Andrea! I just had stumbled on your you tube channel this past week, and now this. woo-hoo! 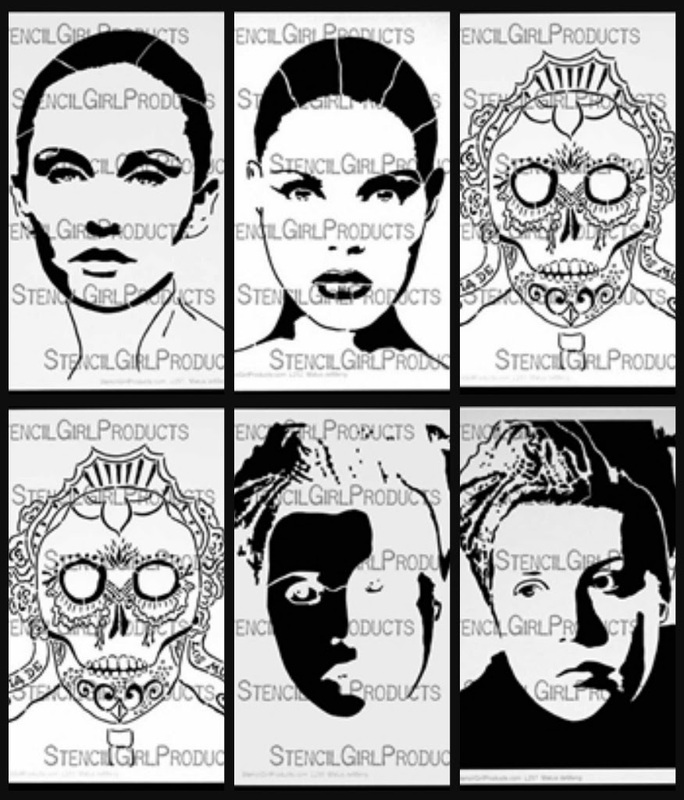 Andrea's designs are a fabulous addition to the Stencil Girl line! Congratulations, Andrea! Welcome, welcome Andrea! What a great big spectacular adventure you bring to Stencil Girl and to us. The creative opportunities are endless with these. Welcome, Andrea! Your stencils are stunning!! Done hopping. Such fabulous projects and inspiration!!! just getting started on the hop. Welcome Andrea! So wonderful to see yet another talented artist join the Stencil Girl family! Andreas stencils are so unique and innovative and your team has showcased them beautifully! Can't wait to play! Welcome Andrea, these designs look great! even more of a reason to be a stencil girl!!!! love your design Andrea!! congrats!! I love these exciting new designs - they are all fabulous but the faces are calling my name!! Congratulations. Welcome Andrea! So glad you're here. I am loving theses stencils. I have been dying to take a class from you in person but this would be the next best thing. I love the large stencils / faces. Squeel! I am in love. Can't wait to see what else you bring to the site. Smooches! Just want to thank everyone for their wonderful comments! You all are making me blush (and grin)! Thank you for the warm welcome and a huge thank you to the StencilGirl Design team for their amazing artworks!